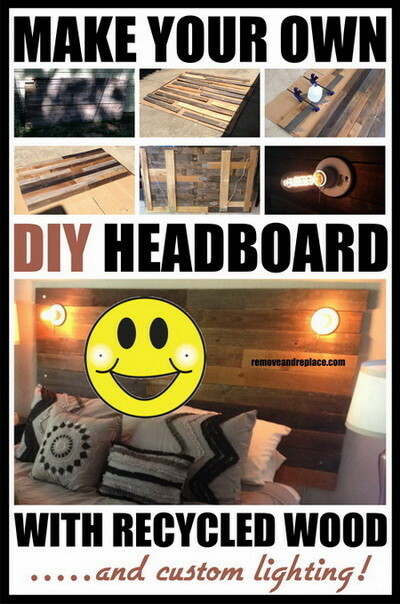 If you are looking for a unique but affordable DIY project, here is a great way to make your own headboard. The great thing about this project is you can build it to fit any size of bed. Whether you have a king, queen, full or another size, the wood you choose can be cut to fit your existing bed perfectly! You can either buy new wood or find a pallet, an old piece of fence, an old wooden door, or anything else made from wood. 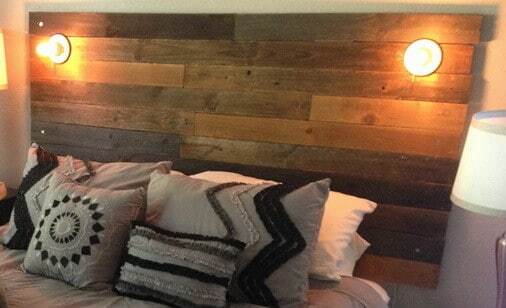 Use your creativity and find something unique to make your DIY headboard. 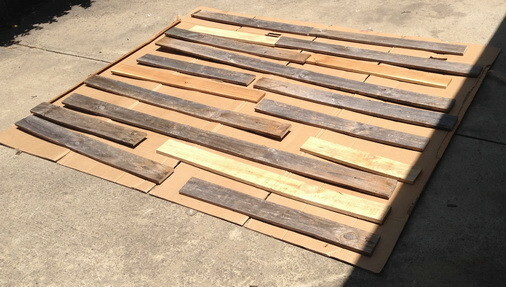 This simple tutorial shows you how you could use an old section of a wooden fence and easily make a headboard. See below for a guided step-by-step picture tutorial. You will also need… wood (either recycled or new), a portable wood saw, a drill with wood bits, electrical tape, screwdrivers, hammer, stud finder (to locate stud in walls and attach headboard), paintbrush. 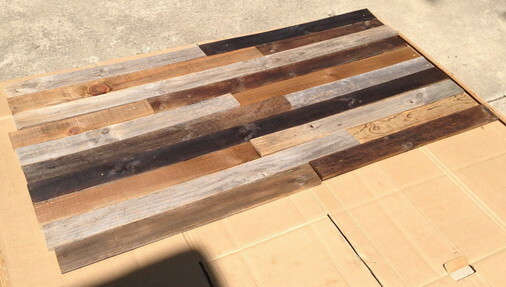 Step 1: Obtain the previously used wood to create your DIY headboard. Make sure it will be wide enough for your size of bed. 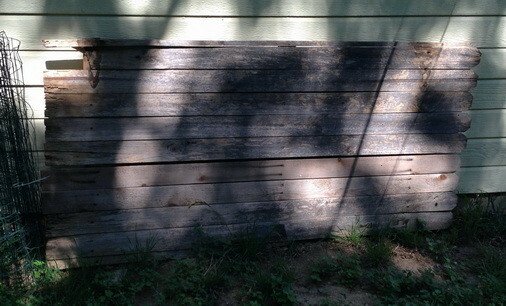 The wood above is from an old fence that was going to be thrown away. Step 2: Take the wood apart (if using recycled wood) or simply lay it out to be sure it will be wide enough. Line up the pieces so it will fit in a rectangular shape. Use only pieces of the wood that are in good shape and not damaged or cracked. Step 3: If any of the wood is not perfectly flat, get it wet and apply weight to force it flat. 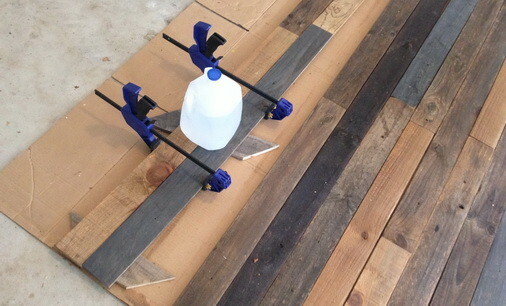 Use jugs of water or anything with a heavy weight to get the boards to lay flat. Once the boards are flat and dry, move to the next step. Step 4: Once the wood is dry and length and width is bigger than your bed, cut the sides even. Make sure to measure the wood to be sure it will be the size you need before cutting the sides. Once the wood is square and the size you desire, it is now time to secure it together. Step 5: Using more of the recycled wood, cut 4 pieces and secure them to the back of the headboard. If desired, you can use metal strips to secure the headboard together as seen in the photo. 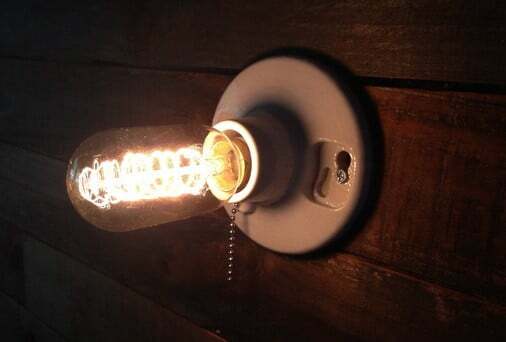 If you want to add custom lighting to the headboard, make sure to drill holes for the wiring and lights. It is recommended to use short wood screws to secure everything together. Step 6: Secure the light sockets to the front of the headboard using small machine screws with nuts on back. Make sure to add everything to the headboard (including optional wood stain) before you attach it to the wall. Once everything is assembled, attach it into the wall studs to keep it securely in the wall. Step 7: Once secured to the wall, test the lights and admire your new DIY headboard project! Make sure it is even on both sides and top and fits squarely over the head of the bed. Have another idea to make a unique headboard? Please let us know by leaving a comment below.